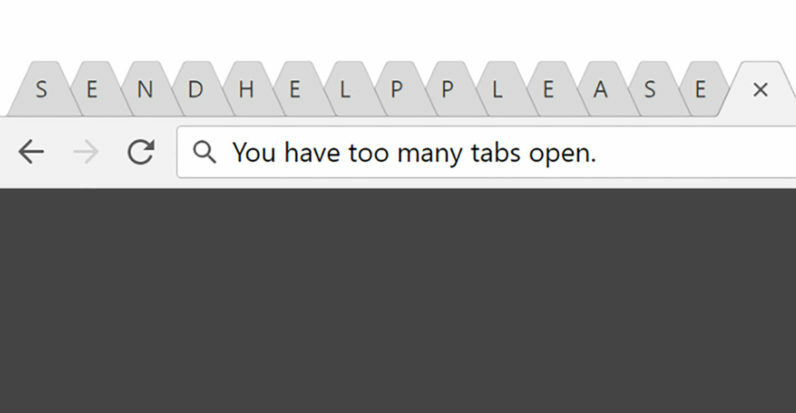 Browser tabs used to help me stay organized. Now they’re part of the problem. For me at least, it’s become second nature to open a page in a background tab to save it for later. That sounds fine in theory, but then half an hour later, I’m buried in so many tabs I can’t even see their titles anymore. More often than not, tabs end up cluttering up my digital workspace, making it harder to find information when I actually need it. Spawning a mess of tabs had became a bad habit, one that was hampering my productivity. There was a time when I frequently cleared out my tabs to keep my computer running smoothly, but in 2017 – espcially running a powerful desktop rig – that’s no longer necessary. And while I’ve tried a myriad of tab management solutions – niche browsers, extensions, etc – none of them really seemed to solve the core problem. Then I realized, I don’t even need to open pages in new tabs in the first place. Most of the time I was opening tabs, I should’ve been opening in new windows instead. Yes, like back in the days when people actually used Internet Explorer. Try using that second option instead. Hear me out for a bit. Tabs were created as an organizational system at a time when browsing the web and running native apps were largely separate experiences, and when opening multiple instances of a browser would slow your computer to a crawl. This is no longer the case. Instead of helping you keep websites tidy, now they just add an extra step to get to the information you want. My typical workday involves alternating between browsers, Slack, SimpleNote, an RSS reader, Adobe Lightroom and Photoshop, and more. But then many of the sites I open in a browser are basically apps themselves – Google Docs, Facebook, Netflix, WordPress, Twitter, Wikipedia, Google Play Music, etc. I could use the desktop version of some of these apps, but the web apps are often better, or the differences are primarily cosmetic. And yet web apps still live on a separate interface layer – the browser – which leads to a sloppy experience when I’m trying to switch software. I normally do that via Task View (Win+Tab) or Alt+Tab on a PC. These commands provide me with a visual preview of all the software I have open, but become much less useful if software is housed on the web. If I want to switch directly to Facebook from Lightroom, I need to first open up my browser, and then sort through the dozens of tabs I have open. It’s an unnecessary extra step that isn’t a problem if you simply open a page in a new window. Press Alt+Tab and now you can quickly pick out the app you’re looking for – whether it’s native or on the web. It may just amount to a second or two saved at a time, but they’re savings that add up over the course of a day. As a nice bonus, this new strategy also means I open up less “read for later” pages I know I’m probably never going to get to in the first place. Having multiple windows open makes me more aware of all the things I have running, and be more selective about what I click on in the first place. All this isn’t to say you should stop using tabs altogether. Once I’ve opened up Wikipedia in a new window, I’ll still keep all my other Wikipedia pages in separate tabs within the same window – or perhaps use tab stacking in a browser like Vivaldi. That way I keep things nice and tidy, but am still able to find Wikipedia when I press Alt+Tab. In an ideal world, there’d be an option so that Windows 10 would show me not just a preview of the apps I have open, but tabs within a browser as well. But in the meantime, next time you think of opening a site in a new tab, try opening it up in a window instead. It’s not a solution for everyone, but if you’re anything like me, it might just make your life a little easier.